Do You Know Your Morphs? Do you know your morphs? Can you sniff out a Ruthless Ripper from an Exalted Angel? Do your friends call you the Smoke Teller? Are your glasses fitted with Lenses of Clarity? Below you'll find morph costs, abilities, art descriptions, tournament hints, and flavor text of morphs. It's your job to figure out which morph is hidden right there in plain sight. Just click on the morph image to reveal the card and see how well you'd survive in a world where things are not always as they seem. This unseen savant grants you glimpses of your opponent's strategy, for just a small peek at yours. A partial art description for this morph reads: Show a huge wood elemental. This one is tall enough to be seen over the evergreen trees of the Temur wilderness—maybe 25 feet tall. This morph lurks around the edge of mana efficiency, gleefully trading up (or unhappily trading down) for a mere 3R. The Sagu Jungle's Think undergrowth conceals even the largest predators—if they wish to remain hidden. Lose the game? Fortunately not. No one was fooled when this morph hit the table while winning the 2003 World Championships. This beastly morph towers over all the rest, the largest morph creature by far. This morph whets your appetite for destruction—of the library. Having conquered the Bastion of Suns, the Ota took its light for their own. 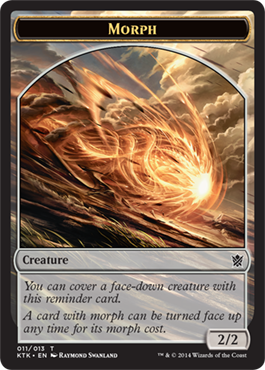 During the design of Khans of Tarkir, Mark Rosewater wrote in Multiverse "This is my favorite morph in the set. I always feel happy unmorphing it."